In the UK, broadband that’s delivered through a 4G connection is rapidly becoming a feasible alternative to fixed broadband delivered through a phone line or cable. 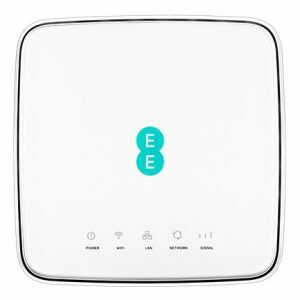 EE’s 4G broadband service is known as 4GEE Home and gives you access to 4G home broadband from £35 per month. According to EE, average download speeds of 31Mbit/s are available on the service: something that’s comparable to a standard fibre broadband connection. 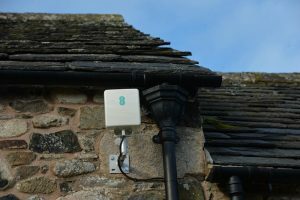 In this article, we’ll review EE’s 4G home broadband service. We’ll start by looking at the price plans and data allowances available, before looking at the included 4GEE Home Router in more detail. We’ll then look at the level of coverage you can expect in your area, before comparing EE’s service to alternative plans from Three and Vodafone. For many people, 4G technology can now deliver similar or even faster download speeds than traditional fixed home broadband. 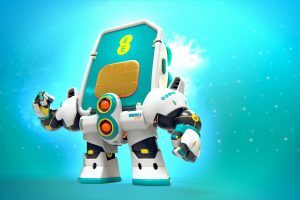 In the UK, EE is now offering a 4G home broadband service with download speeds of up to 60Mbit/s. In practice, however, EE says you’ll get “average speeds of 31Mbit/s in some places”, claiming “that’s faster than standard fibre broadband”. Customers wanting to sign up for EE’s 4G broadband service will need to choose a monthly data allowance for their service. On the low-end, it’s possible to get a £35/month plan with 50GB of data, which should be suitable for some occasional browsing and streaming. Most users will need to look at the plans with at least 100GB or 200GB of data per month, respectively costing £45 or £50 per month. There is no upfront cost when taking 4GEE Home on an 18-month contract. * The monthly price of your 4GEE Home plan will increase every March in line with RPI inflation. You can get an extra 5GB of data added to your EE mobile phone or SIM card plan. Unfortunately, it isn’t possible to get unlimited data on 4GEE Home (this is something that’s available on Three’s rival HomeFi service for just £22/month). It also isn’t possible to use 4GEE Home on a Pay As You Go basis. Customers taking 4GEE Home on an 18-month plan can get an extra 5GB of data added to their EE mobile phone plan. The 5GB mobile data boost is only available if you have an EE Pay Monthly handset or a 12-month SIM-only plan. Download speeds on 4GEE Home are capped at 60Mbit/s, unless you choose a price plan with at least 300GB of data per month. On the 300GB and 500GB plan, download speeds are uncapped. Your 4G broadband service will only work inside the UK as international roaming is disabled on 4GEE Home plans. BT is currently running an upgrade offer to some BT Broadband customers. Customers opting in to the offer will get a two-month free trial of 4GEE Home (you’ll just need to pay your regular BT Broadband subscription fee during those two months). At the end of the two-month trial, you can then decide whether to continue with your regular BT Broadband subscription or with your new 4GEE Home subscription. Customers signing up for 4GEE Home will be offered an Alcatel router that’s custom made for EE. This is a 4G LTE router, allowing you to share an internet connection with up to 32 devices at one time. The router supports 802.11b/g/n/ac wi-fi technology (including on 2.4GHz and 5GHz frequencies). According to EE, this should give you up to “30 meters of wi-fi range”. You’ll also get two Ethernet sockets for connecting wired devices to your network. In terms of mobile connectivity, EE’s router supports up to Category 7 LTE speeds (up to 300Mbit/s download and 100Mbit/s upload). It has a built-in antenna that you can use, with a pair of SMA connectors for connecting an external antenna if you like. For most people, the included Alcatel router should probably suffice. However, it might be worth considering some alternative routers if you need more connectivity options. For instance, the Huawei B525 router is available for about £120 unlocked. 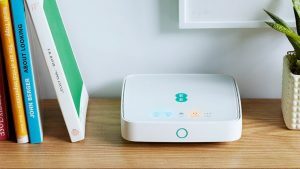 It has 4 Ethernet sockets (versus 2 on EE’s router) and allows you to connect up to 64 devices over wi-fi (versus 32 on the EE router). For a more high-end router, the Huawei B618 (approx £250 unlocked) supports up to Category 11 LTE speeds (up to 600Mbit/s). While you’re currently unable to benefit from the extra speeds on EE’s network, it can help to future-proof your router somewhat. These routers can be combined with an EE SIM-only plan. EE offers a professional installation service of their 4GEE Antenna for £100. The 4GEE Home router has two SMA sockets for you to connect an external antenna. 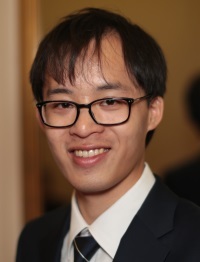 This can help you to get a more reliable connection and faster download speeds, compared to using the built-in antenna from the router. If you like, you can buy an external SMA antenna from websites like Amazon. This can be set up manually to improve your coverage on the service. Our full guide on 4G antennas will tell you what to look for when buying your own antenna. Alternatively, EE also offers a professional installation service of their 4GEE Antenna for £100. According to EE, the 4GEE Antenna will be “positioned on an exterior wall of your property”. A 5m cable will run from the aerial to your router. You’ll need to be either the owner of your property or will require permission from the owner to use the 4GEE External Antenna. The main alternative to EE’s 4G home broadband service is Three’s HomeFi service. Unlike on EE’s service, it’s possible to get unlimited data on Three’s HomeFi for just £22/month. This makes it far cheaper than 4GEE Home, especially for users wanting a larger data allowance. You can use Three’s online coverage checker to see whether a 4G signal is available where you live. Three’s HomeFi service comes with a Huawei B311 4G LTE router. For more information, please read our full review of the HomeFi service. Your ability to sign up for Vodafone GigaCube is subject to 4G coverage and the amount of available capacity on your nearest phone mast. EE offers 99% population coverage (90% geographical coverage) in the UK. At the time of writing, EE offers 99% population coverage and 90% geographical coverage on its 4G network. According to their website, they’re aiming to increase this to 95% geographical coverage by 2020. 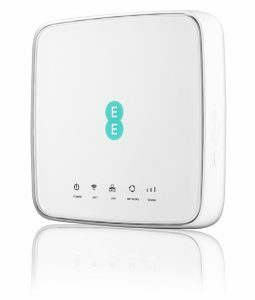 You can also use EE’s combined line checker for both 4G home broadband and broadband through a phone line. This will give you an estimated download speed for both types of broadband and will show you the price plans that are available on each. 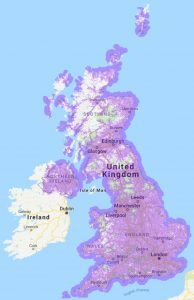 For more information about coverage on different mobile networks, please see our in-depth guide to mobile network coverage in the UK. For more information on 4GEE Home, please see the official EE website.